Justices often try to retire when the president is of the same party as the one who appointed them. Justice Kennedy was appointed by President Ronald Reagan, a Republican. President Trump may be an unconventional Republican, but he is a Republican. Justices also try to retire early in a president’s term, generally in the first two years, according to a 2010 study by Ross M. Stolzenberg, a demographer at the University of Chicago, and James T. Lindgren, a law professor at Northwestern. The study considered justices who served between 1789 and 2006. Justices also take account of who controls the Senate and its internal rules. “So anybody who thinks that if I step down, Obama could appoint someone like me, they’re misguided,” she said. 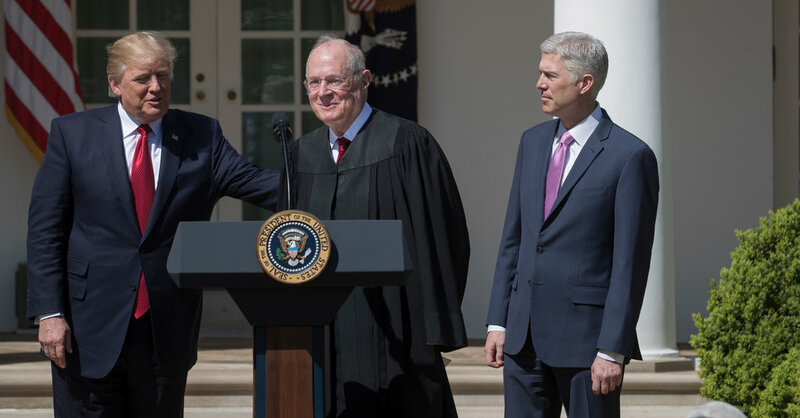 Artemus Ward, the author of “Deciding to Leave: The Politics of Retirement From the United States Supreme Court,” said Justice Kennedy found himself at a crucial crossroads. If he wants to resign under a Republican president in the first half of a presidential term, he must act. Party loyalty is likely to overcome more subtle concerns about judicial legacy, Mr. Ward said. Justice Kennedy holds the crucial vote in many closely divided cases, and he has been drifting to the left. He has cast conservative votes in cases on campaign finance and gun rights but has lately voted with the court’s liberal wing on gay rights, abortion and affirmative action. But Mr. Ward said Justice Kennedy is likely to emulate Justice Byron R. White, who drifted to the right after his appointment by President John F. Kennedy, a Democrat. Even so, Justice White said, it was fitting to retire under a Democratic president because he had been appointed by one. He stepped down not long after President Bill Clinton was elected and was replaced by Justice Ginsburg, whose voting record has been considerably more liberal. A new study on departures from the Supreme Court attempted to refine the conventional factors by considering political science data on justices’ voting patterns, involuntary departures and missed opportunities. It concluded that justices have not been particularly successful at ensuring that they would be replaced by like-minded successors. Justice Kennedy is in a ticklish spot, said the study’s author, Christine Kexel Chabot, who teaches at Loyola University Chicago School of Law. He is, she wrote, a moderate conservative, and there is no reason to think a president of either party would replace him with someone similar. In all likelihood, she wrote, Mr. Trump would appoint a committed conservative like his first nominee, Justice Neil M. Gorsuch. In the few divided cases in which Justices Kennedy and Gorsuch participated in the court’s last term, they agreed just 38 percent of the time. By contrast, Justice Gorsuch agreed with Justice Clarence Thomas, the court’s most conservative member, 100 percent of the time. Ms. Chabot also explored justices’ decisions to forgo opportunities to retire under like-minded presidents. Of the 16 justices since 1954 who reached the age 65 and had served on the court for at least 18 years, Ms. Chabot found, nine passed up politically opportune retirements, risking having to leave the court for health reasons in less attractive circumstances. Two of them — Justices White and John Paul Stevens — retired later on. Justice Sonia Sotomayor replaced Justice Stevens, and her voting record resembles his. Another two, Justices Ginsburg and Stephen G. Breyer, could have retired under President Obama but continue to serve. Try as they might, Mr. Ward said, justices have had only mixed success in deciding when to step down. As for Justice Kennedy, Ms. Chabot noted in an interview that he has hired law clerks for the term that starts in October. “I wouldn’t be surprised if he remains on the bench,” she said. Amazon is coming to Queens. So are the helicopters. November 14, 2018 Comments Off on Amazon is coming to Queens. So are the helicopters.